Use the code PCG at checkout to knock 20% off ticket prices. Do you need some tips on the world of PC hardware? Need some new skills? Want to freshen up the old talents? You're in luck. 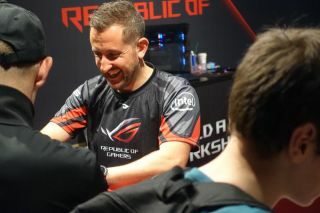 ASUS/Republic of Gamers has teamed up with Youtube star Tom Logan to bring a bunch of workshop sessions to this year’s PC Gamer Weekender. OC3D host Logan returns to the Weekender after his appearance back in 2016, and will be on hand to dispense all of his considerable know-how to those attending the ASUS/ROG sessions. In the practical build session Tom will guide you through assembling a gaming PC from scratch. We’ll bring everything you need including ASUS motherboards and graphics cards, Intel CPUs and Corsair RAM. You’ll come away from this session with the confidence to build your own systems at home. If you're looking for ways to squeeze extra performance out of your current rig, check out our overclocking and tweaking session. We'll cover software overclocking and manual tuning in BIOS. We’ll also discuss the technology allowing ROG motherboards and Intel CPUs to get the best overclocks. How far can TinyTomLogan push an 8700K? If you have any questions about PC hardware or PC building then you can ask our experts anything in the PC Clinic. If you're completely new to gaming PCs then our PC Basics session will get you up to speed. These workshop sessions will be joined by many more speakers, games and booths all at the PC Gamer Weekender, which is being held February 17-18 at the Olympia, London, in the UK. For more details see the site, and follow us on Twitter for up-to-the-minute news. Tickets are available now from £12.99, but you can use the code PCG at checkout to knock 20 percent off the price.